There have been some great improvements lately in the downtown area. (I assumed the DDA was doing most of them, but I don’t see anything on their web site). Of course, we have all heard about the LED traffic street lights. Now there are new bicycle racks on many downtown streets. The crosswalk lights in the Main Street area have countdown timers. And finally, finally, all the parking structures now have these nifty “Parking Spaces Available” signs. If I recall, that was a Steve Bean idea, no? Bravo, Steve (or whomever did it). Car Talk ran a puzzler recently asking listeners to identify the one great flaw of LED lights, and the answer turned out to be that they operate at such a cool temperature that they can’t melt snow that falls on them. Has anyone thought of this? Ah, but global warming will get rid of the snow. Problem solved! All the lights I’ve seen have protective shields over the tops so I’m not sure much snow would actually be around the light. Also, I can see where the freeze/thaw cycle would be more problematic than if the lights just stayed the same temperature as the air around them. And LEDs are a lot better than fluorescent lights, which don’t actually work well at all at low temperatures. But it is an interesting question. I guess we will see this winter. The parking structure numbers are interesting. So far, my impression is that there are definitely more spaces available than I would have thought although I am not walking by at prime time. I heard that at noon on Thursday, there were only 49 spaces available at Ann Ashley, so that is fewer available than I would have thought. 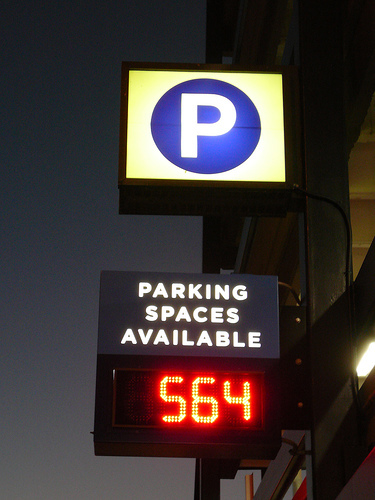 It will be interesting to see if posting the numbers changes parking behavior. My guess is that more people will park in the structures now. If the parking availability signs was my idea, Todd, your memory is better than mine. One parking idea I do remember was suggesting to Susan Pollay that spaces be put in front of Ashley Mews on Main to support the businesses there (and increase downtown parking cheaply.) That one was nice to see implemented. I have encouraged the LED lighting (both in the traffic signals and streetlights) and was quoted in the News about my appreciation of the demonstration lamps on Washington. But I’ve barely been a cheerleader—all the credit goes to City staff. Snow on the lamps shouldn’t be a problem. The lights are appropriately aimed downward so as to not waste energy lighting the night sky. (Not by dint of the draft outdoor lighting ordinance, however, which is still under review and hasn’t been passed by council yet.) And even if temperature were an issue, the snow would insulate the lamps from radiating heat to the sky on clear nights. LEDs generate so little heat that I doubt that it matters. I love the LED lights. I park a lot at the S Forest and when I see there are fewer than 100 spots open, I know I have to drive all the way to the top. Which speeds the hunting for a spot process. Makes my Ann Arbor driving experience that much more enjoyable. As a follower of the Energy Commission… Do you know about the Green Energy Challenge? The Mayor put it out back in 05. It’s on the web page. The challenge is for the city to use 30% renewable energy by 2010 for everything, vehicles, streetlights, heat, hot water. They just put a solar hot water heater on the downtown fire station with more coming. The A2 news covered the LED’s last week. The LED streetlights were initiated by city engineer Mike Bergren. He went out and found manufacturers and worked with them to develop prototypes. If you saw the news story you would know A2 is the first city in the country (maybe world) to start installing them. Tomorrow they are holding a press conference to announce wining a big award from the feds. Someone from the USA DOE is going to be there (Farmers Market at 10:30) along with Dingell and the mayor to kick it off. Hieftje got the DDA to cover the cost. Fox 2 ran a slick 4 or 5 minute news story on the LED streetlights a week or two ago. Featured the mayor and Konkle. A2 is the first in the country to install them. I saw something in the Freep about it too. I think the story was picked up nation wide by the AP. Julie, the “LED traffic lights” link should read “LED street lights”. The city’s traffic signals are also being converted to LEDs (colored ones), but I don’t know the progress of that effort other than that the new signals just installed in the Main Street area include them. Dustin, if your question was directed to me, the answer is yes. OK, Steve, it is corrected. A fix for LED traffic lights and snow.